Tyler Perry says that he is retiring Madea, the feisty, foul-mouthed grandma who launched his career and made him million of dollars. Tyler Perry has played Mabel Earlene “Madea” Simmons for nearly 20 years. He is putting away his gray wig, glasses and long floral dresses for good. “I’m happy to kill that old b***h, I’m tired, man. I just don’t want to be her age, playing her,” says Tyler Perry according to CBS News. 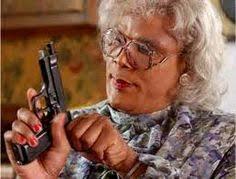 Tyler Perry is forty-nine and Madea is in her sixties. Fans of Madea will have plenty of time to say goodbye. Tyler Perry said he is taking Madea on a farewell stage tour, and he says he’ll use 2019’s Family Funeral movie to end her storyline. It is not made clear if the funeral is for Madea herself. There are eleven Madea movies and ten Madea plays. The first Madea appearance was in 1999 in the play, I Can Do Bad All By Myself. Tyler Perry didn’t make his first movie with the Madea character until 2005 in the movie, The Diary of a Mad Black Woman.